In an era of SUVs and hard-riding Germanic sports sedans, finding a comfortable full-size car isn’t easy. And if you want attractive styling, high-quality materials, and a hybrid powertrain… well, your options are limited. Fortunately, though, the full-sized Buick LaCrosse checks all those boxes—without carrying the price tag of a luxury car. The automotive press has a fondness for German engineering, so when they fall in love with an American car you know it’s time to pay attention. The LaCrosse nameplate first saw daylight on a well-received mid-sized sedan back in 2005. The second-generation LaCrosse, (known briefly as the Allure,) arrived in 2010, and the critics were smitten. Now it’s been completely designed, and the press has taken notice. If that’s not enough, the LaCrosse is winning industry plaudits too. 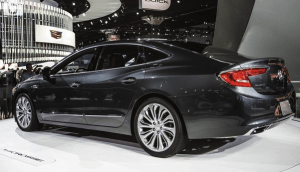 The automotive equivalent of the Oscars are the “Ward’s 10 Best” awards, and the 2017 Buick LaCrosse took honors for its high-quality interior. Parked in your driveway, the LaCrosse looks every inch the prestige sedan. A traditional “waterfall” grille signals the Buick heritage, but here it’s updated with a “wing element.” Together with the sculpted hood and angled headlights, the effect is reminiscent of some European rivals. Elsewhere, attractive details abound, like mirror-mounted LED turn signals and 18” alloy wheels. Buick offers the LaCrosse in four trims—starting with the well-equipped 1SV (power seats, 8-speaker audio, dual-zone climate control and a leather-wrapped steering wheel) and getting more luxurious as you move up. The Preferred level adds useful touches like a power-adjustable steering column and a cargo net along with satellite radio. The Essence trim includes these and adds perforated leather upholstery, heated front seats, memory settings on the driver’s seat and outside mirrors and wireless phone charging. But spring for the Premium and you’ll really be pampered. The ventilated front seats come with a massage function, the steering wheel is heated, and there’s a host of safety technology. Forward collision alert, lane-keep assist, and blind spot detection are all included for your protection. Large sedans ride smoothly in part because of their longer wheelbase. The 5m long LaCrosse puts nearly three of those metres between the front and rear wheels, which gets it off to a good start in the comfort stakes. Factor in a width just shy of 2m and there’s ample space for five full-grown Canadians. Out back a 425-litre trunk takes care of their luggage. Under the hood of the 2017 model, a 3.6 litre V6 drives the front wheels through an eight-speed transmission. (All-wheel drive is optional with Premium trim.) City fuel consumption is 11.2 L/100km, while the Highway figure is 7.5 L/100km. Those are good numbers for a big car, but many owners would like better. If you number among them, it’s time to look at the 2018 LaCrosse. 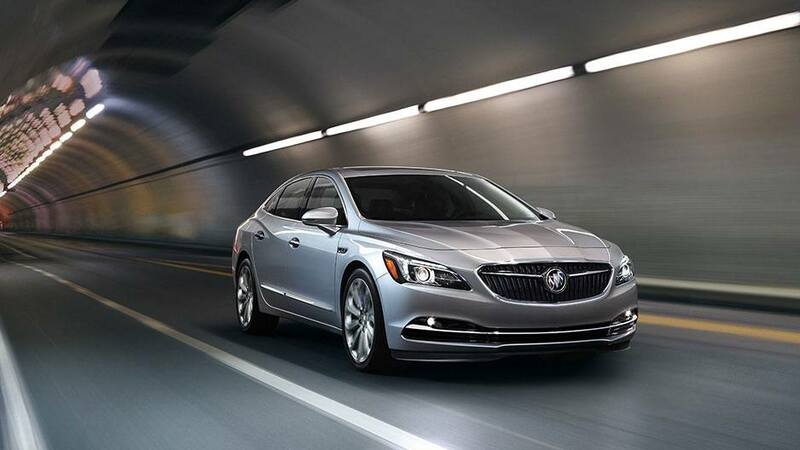 If you haven’t yet gotten the message about the Buick LaCrosse, we’ll spell it out for you—this is a classic, full-size sedan packed with the very latest technology. Unlike some rivals, the ride won’t send you to the chiropractor, and with eAssist it won’t have you watching the gas gauge either! Visit us at Budds’ Chevrolet Cadillac Buick GMC and see for yourself.